At a time when our nation has seen deep divides over race, a small city in North Carolina has worked to bring its community together despite all of the odds. Although Lexington city officials knew that spending money on parks and recreation had the potential to generate economic activity, improve the quality of life, and indirectly increase property values, there was also a realization that financial barriers were not the only obstacle they faced in fixing their aging facilities. For years, the city had struggled with its recreation plan. One of the main problems was the need to find the right approach to gain buy-in from the community. City Manager Alan Carson embarked on the plan initially as a way to address some major issues with the city’s two swimming pools. The pools were not being used, they were in need of repair, and, worst of all, they were racially isolated by location. Carson wanted to create a new pool that was not only state-of-the-art but would be welcoming to all residents. To do that, he needed to remove the pool in the historically black community. “It was in really bad shape, and I didn’t want to pour money into something no one was using,” Carson explains. The other pool, in the historically white neighborhood, was only four feet deep and completely inadequate. “This was something former city managers and council members had tried in the past, and they were not successful,” says Carson. When it was initially announced that the pool in the black community needed to be removed, it was not well received. “People were lined up outside the city council chambers, upset that we were taking away the pool. It was pretty bad. I had to build some trust within the community. People were told for so long that they were going to get a recreation center and other things, and it never happened,” Carson notes. That is when Carson looked to the Parks and Recreation Facility Development Master Plan. The study showed there was community interest in having a splash pad. The study also showed interest in a skate park. “So I decided to remove both pools, to be fair, and build the splash pad in one community and the skate park in the other,” says Carson. “It was easier to give city council members a vote in favor of adding something positive in the community, rather than a vote to tear something down.” Still, there was a problem. The community needed a pool, and it could not be located in either neighborhood for the sake of fairness that the city manager vowed to uphold. Fortunately, the city had a pool gifted to the community. That gift has been revamped and is now known as Lexington Aquatic Park. Both the park and the splash pad are significant attractions for families. Through this process, the city was able to repair its relationship with the community, and now it looks ahead to build on recent successes. “The citizens’ thought process before was ‘it’s not great, but we’re just Lexington.’ Well, everything we’ve done so far has been first-class, and I think that’s really important,” says Carson. The final piece in the four-phase “Re-creation of Recreation” project is an indoor recreation facility. This is something the citizens have been wanting for literally decades. “We have studies that date back to the ‘60s on this,” says Carson. Statistics, demographics, citizen involvement, and four independent studies have routinely supported the critical need for a safe, fun, and education-oriented facility for area youth. This facility will result in the expansion of current programming, activities, and athletics. It will also allow for a safe, positive environment for youth to be active physically, while being mentored by adults with a passion for investing in the future generations of the community. “The ultimate goal is a ‘wow’ factor since the citizens have waited for so long,” Carson explains. Lexington looks forward to the four pieces of the puzzle that make up the “Re-creation of Recreation,” all working together to better the community, which has already come together with a mix of ethnicities laughing and enjoying the newest facilities. City officials believe they will continue to see this, as well as a financial impact from all of the projects. The city has already seen an incredible increase in attendance at the pool. In the past, around 4,400 people attended both pools in a given year. The most recent numbers show an attendance of around 15,000 over the last year at the aquatic park. The splash pad is also generating excitement. 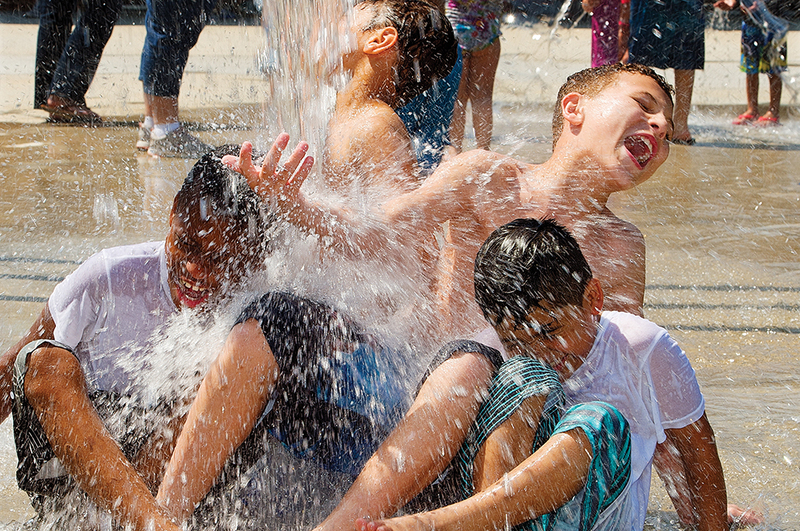 “In our first summer, we were receiving calls from camps and groups in neighboring communities asking if it was OK to bring their kids to the splash pad. It was packed all summer,” Duran notes. So far, everything has been right on track, and Lexington is confident about its future. Kelly Coggins is the Communications Specialist for the city of Lexington, N.C. Reach her at KRCoggins@LexingtonNC.gov.